Salle Opticians was founded in 1987 and continues to be the premier independent eyewear destination in Atlanta. After 30 years of dispensing beautiful eyewear, I am proud to say that Salle Opticians has one of the most experienced staff I've ever worked with. They are all licensed Opticians combining various strengths and specialties and providing a team effort to ensure a great experience for our customers. Specializing in unique eyewear collections, we travel all over the world to provide you with the latest creations from small independent designers. Our staff regularly attend continuing education classes and conferences to keep up to date on the latest technologies, trends and health care practices. When you come in to Salle Opticians you will experience a level of customer service not seen in many other eyewear stores. You will also see collections not found elsewhere, many of them exclusive to us or custom-made. We look forward to earning your trust as a loyal client of Salle Opticians. As a licensed Optician for 30 years, I have seen styles come and go and come again! I enjoy traveling to different countries to find collections not readily available in the United States. Eyewear is more of a fashion accessory today than at any other time and the challenge is to stay at the forefront of fashion rather than following others. Bob has been with Salle Opticians since 1991 and has seen eyewear evolve from a necessary item to a desired fashion accessory. As our technical director it is his job to keep us appraised of industry developments to make sure we are at the forefront of any new lens technology. You will see Bob on the sales floor and he too specializes in more challenging prescriptions. Brandon joined Salle Opticians in 2005. He was searching for a company that could offer the very best luxury eyewear combined with the latest lens technology. He found his home! Brandon became licensed in 2006 and has become an expert in the Cartier line, helping customize lenses, tints and even jewels to make sure your sense of style and fashion materializes into a perfect pair of glasses. Brandon is always ahead of the eyewear trends no matter what you are looking for. 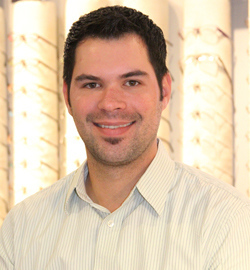 Darryl has been a sales consultant within the Eyecare industry since 2008. He is an expert in fashion and frame selection and is apprenticing to become a Licensed Optician. Vicki has 15 years industry experience and has been a licensed Optician in several states. Since moving to Atlanta in 2017 she has joined our team and is waiting to become licensed in Georgia. She is extremely knowledgeable in all facets of the industry but really enjoys designing custom eyewear shapes.